Department of Biomedical Sciences, School of Biosciences and Technology, VIT University, Vellore, Tamil Nadu, INDIA. Medicinal plants have been used as therapeutic drug throughout the world. But, a very few of them have been scientifically validated. Samanea Saman belongs to the Leguminosae family commonly known as rain tree and is native to tropical America. S.saman tree has different parts like a leaf, fruits, pods, seeds, and wood. S.saman is currently studied for the production of biogas which is easily obtained in the urban and rural areas. S.saman has been used in traditional medicine as a remedy for the treatment of different diseases. The phytochemical screening of the plant revealed the presence of alkaloids–C8H17ON and C17H36ON3 pithecolobine and saponin (samarin). Natural products are mainly derived from medicinal plants, which are tested in vitro and in vivo models and used to investigate the mechanism of action of drugs with potential biological properties. Additionally, S.saman were recommended as the suitable tree for planting in the urban environment as this species can reduce the outdoor temperature for all types of ground covers. This review is mainly focused on antioxidant, antibacterial, anti-diabetic potential, insecticidal, antifungal, analgesic, anti-ulcer and cytotoxic activities. However, this study helps to develop new strategies for the designing of novel drugs to treat various diseases related to human race. Medicinal plants have been used from ancient times to combat against different diseases from the daw, of human civilization. Medicinal plants are rich in secondary metabolites. In the middle of the 19th century different bioactive compounds were isolated and characterized from plants.1 According to the World Health Organization (WHO) in 2008, 80% Population of the developing countries and facing difficulties to afford synthetic drugs 2 and are relying on traditional medicines mainly of plant origin to maintain their health care needs. The World Health Organization (WHO 1985)3 supports the traditional medicine due to the inspiration of novel drug compounds from the natural source of plants. Such plants have derived medicines which made large contributions to human health and in both developing and developed countries have been great achievements in the field of herbal drugs because of their natural source and fewer side effects.4 The medicinal plant had shown an extensive interest in this field and it recognized that these natural products are true remedies for the human health benefits. Various parts of the medicinal plant are used properly and scientifically it reaches worldwide.5 Plants have a potential source of natural antioxidants which includes secondary metabolites.6,7 Plants have been considered as the main source of antioxidant that inhibits the growth of free radicals. Ascorbic acid, flavonoids, tocopherols, folic acid, cinnamic acids, benzoic acids, tocotrienols, carotenoids etc., are some important antioxidants found in plants.8 Basically, ascorbic acid, alpha tocopherol, and Beta-carotene have generally used antioxidants because of its ability to scavenge the free radicals.9 The tribal areas of medicinal plants have valuable properties and most of the advantages are still restricted because of raw knowledge and absence of proper scientific validation.10 Natural bio-compounds of medicinal plants can be classified into Alkaloids, Cardiac glycosides, Steroids, Saponins, Tannins and Flavonoids. It is estimated that more than 250,000 to 500,000 species of higher plants on globe level were suggested as medicinal plants.11 Therefore, it is the need for the search of herbal materials that have potential activities against various diseases with less toxicity, free from side effects and would act as substitutes for synthetic drugs. Hence, it is assured that the S.saman presented in this review will be useful for researchers and practitioners to find potential natural agents. Samanea Saman (Jacq.) Merr, which is commonly known as “Rain tree” belongs to the Leguminosae family and also called as Albizia saman.12 Scientific classification of Taxonomy Kingdom: Plantae, Order: Fabales, Family: Fabaceae, Genus: Samanea Saman, Species: S.saman and exhibits the synonym names of S.saman such as Albizia saman, Enterolobium saman, Inga saman, Pithecellobium saman,and Mimosa saman. Rain tree is easily known for its characteristics like umbrella-shaped shelter. Rain tree is grown in the open and usually reaches 15-25m (50-80ft) in height.13 S.saman is one of the most important plants in the Pacific as a shade tree on small farms and along road side areas in parks and pasture. The rain tree is grown in the tropical environment and its wood has limited use for carved bowls, craft wood, and fuel wood. The leaves and pods of rain tree are used as food due to the high nutritive content and nitrogen fixing capability.14 A huge number of uses are documented for S.saman, it naturalizes generously almost everywhere it has been introduced and is considered as an enveloping pest in Vanuatu and Fiji. 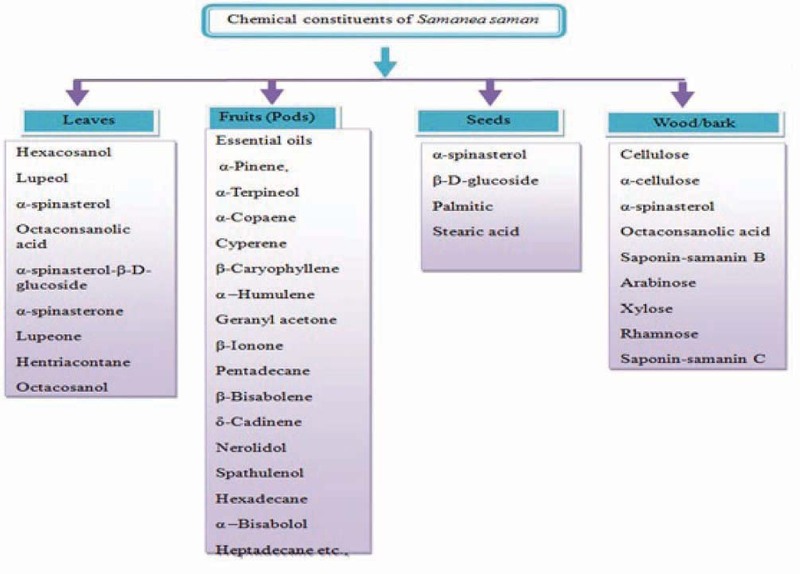 The different therapeutic activities of S.saman have been reported.15 S.saman shows several bioactive compounds which possess various medicinal properties such as antioxidants, antibacterial, anti-diabetic, analgesic, anti-ulcer, insecticidal, antifungal, and cytotoxic activities.16 Hence the present study on S.saman is focused on its phytochemicals and pharmacological activities. S.saman is widely distributed in the tropical and subtropical countries. Rain tree is extensively cultivated in throughout the worldwide S.saman is the native of Central America and in Northern South America.17,18 It is widespread in Thailand,19 Peru, Brazil, Bolivia and Mexico.20,21 In these above-stated areas, it occurs in low-elevation dry forests and grassland habitats. Figure 1 shows different parts of the S.saman (a) leaves, (b) flowers, (c) barks and (d) pods. In view of increasing interest for these herbal drugs29 two compounds were isolated from the crude methanol extract of S.saman, namely Lupeol and epi-lupeol. Compounds were analysed by TLC and high-resolution NMR spectral data with authentic samples. The preliminary screening on, carbon tetrachloride, n-hexane and a dichloromethane soluble fraction of methanolic extract was analysed for antimicrobial activity and brine shrimp lethality bioassay. While the carbon tetrachloride extract showed a moderate result in antimicrobial activity and strong cytotoxicity with LC50 of 0.831µg/ml.33 Various other compounds were isolated from different parts of S.saman extract of dichloromethane. The structures were identified by NMR spectral data, 1H (or) 13C NMR. 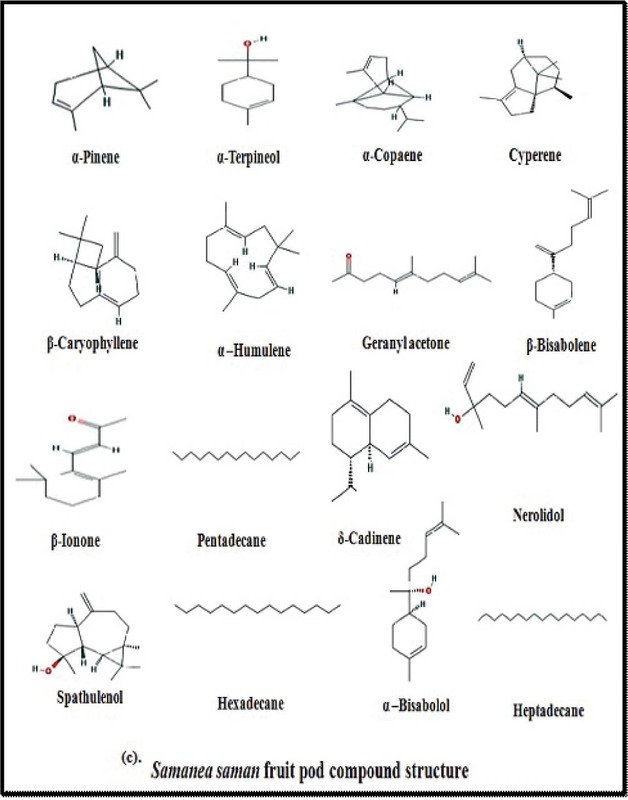 Compounds identified in leaves are Lupenone, chlorophyll, and Lupe none, and from twigs unsaturated triglycerides, peduncle; α-spinasterone and α-spina sterol. Green synthesis methods have advantages such as mixed valence of polysaccharide, polyoxometalates and conventional methods are involving in chemical agents related to environmental toxicity. The most important issues are considered in green synthesis of nanoparticles, based on the selection of solvent medium and selection of eco-friendly nontoxic reducing and stabilizing agents.39 This eco-friendly method can be potentially used in the different fields. In this study, S.saman mediated synthesis of TiO2 nanoparticles.40 have utilized leaf extract for the preparation of TiO2 nanoparticles. The authors stated that secondary metabolites were responsible for the reduction of bulk TiO2 to TiO2 nanoparticles. Further, they were subjected to dye degradation and in water treatment. Free radical causes oxidative damage to the human body and finally leads to chronic diseases.45 Moreover, free radicals such as reactive oxygen species (ROS) and reactive nitrogen species (RNS) are produced by heat and endogenous processes such as metabolism, respiration and phagocytosis and they are also generated with exogenous methods such as during radiation, organic solvents, pesticides and some pollutants. Antioxidant associated with lower risks of degenerative disease, mainly in cardiovascular disease and cancer etc.46 A Natural antioxidant is a group of the compound that inhibits the oxidation of lipids and other bio molecules and therefore prevents the oxidation damage to body cells.47 Antioxidants are considered as important to the human health. In recent years, many medicinal plants have been widely studied for their antioxidant activity. 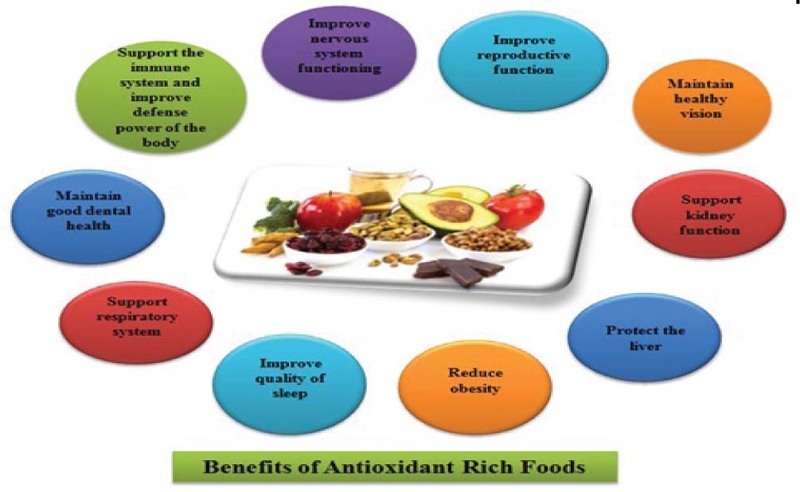 There are several benefits of antioxidant which have clearly shown in the Figure 4 (a), (b). Different studies were focused on the medicinal plants and their applications in the food system to prevent the oxidation. 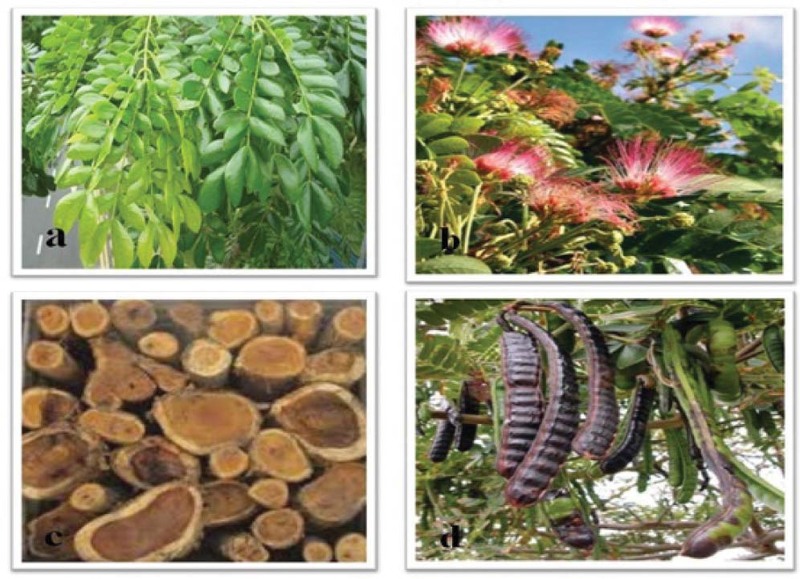 Methanolic extract of Albizia saman has shown the protective role of on antioxidant activity was measured in (DPPH) 2,2-diphenyl-1-picrylhydrazyl (DPPH) radical scavenging capacity, reducing power and total antioxidant capacity of Albizia saman were determined by phosphor molybdenum method and the result shows good antioxidant properties and it also supports the use of Albizia saman in herbal medicine.41 In another study, the alcoholic extract of S.saman was assayed for their antioxidant activities, 70 percent of alcoholic extracts have been investigated in various assays of reducing power and Nitric oxide radical scavenging activity. These results indicate that S.saman can be used in this application. It showed scavenging activity against the standard of ascorbic acid. Three different solvents were used by based on the increasing polarity of benzene, ethyl acetate, and methanol in different ratios. TLC analysis has been used to monitor the fractions, that similar fractions were subjected to antimycobacterial activity. The result was observed at the concentration of 20µg/ml and the ratio of 80:20 ethyl acetate: methanol reveals the antimycobacterial activity. This fraction was reported to be completely resistant against Aspergillus Niger and Pseudomonas aeruginosa. Samples have been subject to UV and IR analysis to identify the absorbance and functional group correspondingly.51 In literature,52 author isolated the compounds and performed an antimicrobial activity against different strains, using 80 percent (%) of methanol extract of S.saman leaves. The isolated compounds are known as macrocyclic pith colobines (1) and (2), and macro cyclic spermine alkaloids. Compounds structure was analysed by spectrum and it was compared with literature survey. The test was performed using disk diffusion method. As a result, it was observed that 80 percent (%) of methanolic leaves extract has shown the inhibitory activity. It against most common microorganisms such as g-positive bacterium Bacillus subtilis and four different fungi Aspergillus flavus, Aspergillu Niger, Penicillium oxalicum and Cladosporium oxysporum isolated from sick buildings. MIC test shows that isolated two compounds act against the microbes, alkaloid (2) range is 0.019-0.625µg/ml and alkaloid (1) 0.312mg/ml inhibited the Bacillus subtilis. Microbial activity has been traced to the isolated compounds such as an alkaloid pith colobine (1) and (2) is using orderly the fractionation directed by antimicrobial assay Figure 5. Diabetes mellitus is a non-communicable disease with multiple disorders characterized by a loss of glucose homeostasis with disturbances of carbohydrates, protein and fat metabolism ensuing from defects in insulin action, insulin secretion, or both.53 In worldwide, more than 100 million people are affected by diabetes and are considered as the leading causes of death in the world.54 A lot of researchers and investigation are focused on the anti-hyperglycaemic activity of plant origin reported in the traditional medicine.55 In previous studies, many of them have been found to possess the positive results. Various standard drugs that are available in the market to reduce the glucose level may cause side effects. 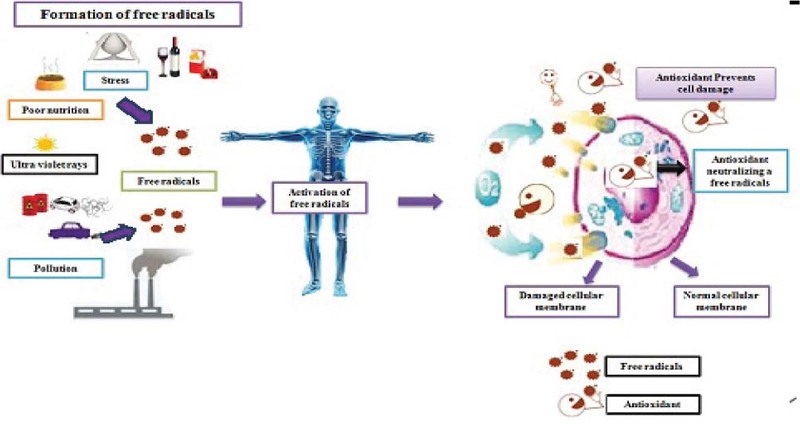 Therefore searching for a new medicinal plant with bio-constituents is necessary.56,57 reported that selected medicinal plant S.saman methanol leaves extract showed anti-diabetic activity in both in vitro and in vivo studies. In this α-amylase inhibition it shows various increasing concentrations are 50μg/ml, 100μg/ml, 150μg/ml, 200μg/ml, and 250μg/ml. Two different concentrations of methanol extract, 250 and 500 mg/kg body weight of doses were administrated to diabetic induced rats. Significantly it could reduce the blood glucose level (p<0.001) at1 and 2 hrs, (p<0.05) 30mints respectively and it was compared to the control group of diabetic induced rats. Thus, this new class of bio- constituents may be suitable for the treatment of diabetes mellitus. Inflammation is a natural response to tissue injury which is caused by physical trauma, toxic chemicals, and pathogenic microorganism. It can be characterized by redness, swelling, and pain. Cyclooxygenase (COX) is an enzyme, which is involved in the synthesis of prostaglandins, prostacyclin’s, and thromboxane’s for the inflammation. Currently, NSAIDs drug is used for the reduction of inflammation by blocking COX1 and COX2 enzyme activity. Since NSAIDs is a steroidal anti-inflammatory drug that cause adverse side effects and damage the human biological system. So, there is a need of potent and nontoxic anti-inflammatory drug. WHO has reported that about 80% of the world population depends on plant based drugs.58 has reported the anti-inflammatory activity of methanolic extract S.saman bark. The results showed that five different concentrations (0.25, 0.5, 1, 2,4mg/ml) have the inhibition of 51% haemolysis at the highest concentration, and it has been compared to the standard drug of diclofenac sodium which has 29% inhibition of haemolysis. Therefore, the presence of phytoconstituents such as flavonoids, tannins and phenolic compounds and glycosides in this S.saman extract may be responsible for anti-inflammatory activity and be used in this file, followed by a clear scientific investigation. Different parts of the Samanea Saman (a) leaves, (b) flower, (c) bark and (d) pod. Chemical constituents of Samanea Saman. Ulcer disease is considered as one of the most common diseases in the world. It is a gastro intestinal disorder due to an imbalance between the aggressive factors like acid, pepsin, Helicobacter pylori and defensive factors like bicarbonate secretion, prostaglandins, gastric mucus, and innate resistance to the mucosal cell factors. Generally, ulcer develops when aggressive factors overcome the defensive factors. The major factors that disrupt the equilibrium between aggressive factors and defensive factors are Helicobacter pylori, acid–pepsin hyper secretion, non-steroidal anti-inflammatory drugs, sometimes idiopathic due to usage of tobacco, psychological stress, rapid gastric emptying, and Zollinger - Ellison syndrome where there is a high and uncontrollable production of acid might lead to ulcer formation,59 has investigated the methanol extract of S.saman bark and evaluated its anti-ulcer activity. Stress induced by Gastric lesions was induced in albino rats by oral administration of absolute ethanol (5mL/kg) and stress by water immersion. Various concentrations of methanolic extracts are 100mg/kg, 200mg/kg and 400mg/kg and it was compared to standard drug of sucralfate (100mg/kg). The result shows % inhibition at 65.67, 72.43 and 86.49 and (100mg/kg) standard drug sucralfate shows the inhibition of 92.16. Methanolic extract 200mg/kg and 400mg/kg body weight exhibited the significant values (P<0.001) showed on acid parameters and it was compared to the ulcer control group and in water immersion it showed the significant value (P<0.001), % inhibition of 53.30, 71.11 and 87.69 to 100mg/kg, 200mg/kg and 400mg/kg and standard exhibited 92.68. Hence the methanol extracts of S.saman exhibits anti-ulcer activity. Allelopathy is a biological phenomenon and refers to some process involved to produce the (allelochemicals) secondary metabolites from plants, microorganisms, fungi and viruses that influence the growth of agriculture and biological methods including the positive and negative effects.61,62 Allelochemicals that released into the environment by exudation as of roots, leaching from stem and leave. Allelopathy, a new strategy for plants has some important mechanism of plant meddling mediate by the addition of plant produced (phytotoxins) to the plant environment63,20 have tested the allelopathic effect of S. saman and three different medicinal plants namely Amaranthus viridis, Brassica campestris, Oryza sativa. Various concentrations of samples were taken as a 0, 1, 2 and 4 percentage. The leaf leachate effect on germination seeds was studied. Results exposed that the plant S.saman has the inhibitory effect on Brassica campestris, and Amaranthus viridis, while rice plant of Oryza sativa is opposed to the effect of leaf leach ate. The largest organ in the human body is liver and it is the site of metabolism and excretion. The surprising role of the liver is performance, maintenance, regulating homeostasis of the body and involving in almost all the biochemical pathways.64 The liver is the major function junction of carbohydrates, proteins, and fat metabolism, bile secretion, storage of vitamins and detoxification. Liver diseases have become a global health problem and it causes a significant amount of morbidity and mortality.65,66 Liver disease is classified as the acute or chronic disease like cirrhosis of degenerative disorder resulting in liver fibrosis, hepatitis of inflammatory liver diseases and hepatosis of non-inflammatory diseases.67 Synthetic drugs for the treatment of liver disease sometimes may cause serious side effects. As in earlier days, mankind has complete use of the medicinal plant to treat the various ailments as their toxicity must lower side effects. In literature,68 focused their research on the hepatoprotective activity of methanol extract of S.saman against albino rats with liver damage induced by carbon tetrachloride.400 mg/kg body weight of methanol extract was administrated into rats and it reduces the serum level of ALT, AST, and cholesterol. While in the serum, enzyme activity shows the significant increase in the levels. Blood samples were estimated on liver injury caused by carbon tetrachloride and it shows the resulting decrease in the serum levels, representing the production of hepatic cells. Leaf contains 22-27% of crude protein. In Asian countries are used as a livestock forage supplement for cattle etc. Nutritional values of the pod that contains 12-18% protein, the pod are ground into a nutritious animal feed in South American. Plants have a natural source of medicines to treat various types of diseases, but still many plants have not been well characterized. S.saman is a multipurpose tree, adaptable to tropical conditions and with great potentiality act as alternative feed for ruminants and monogastric. In this review, hereby conclude that S.saman also showed a broad range of pharmacological activities such as antioxidant, antibacterial, anti-diabetic potential, insecticidal, antifungal, and analgesic, anti-ulcer and cytotoxic activity and effects due to the presence of phytoconstituents. Further study must be carried out to assess the exact mechanisms involved in S.saman and it also contains natural compounds. Isolation and characterization of such specific may be used to treat the targeted gene or enzyme. This further leads to the development and discovery of novel traditional medicine against various diseases without any adverse effect. 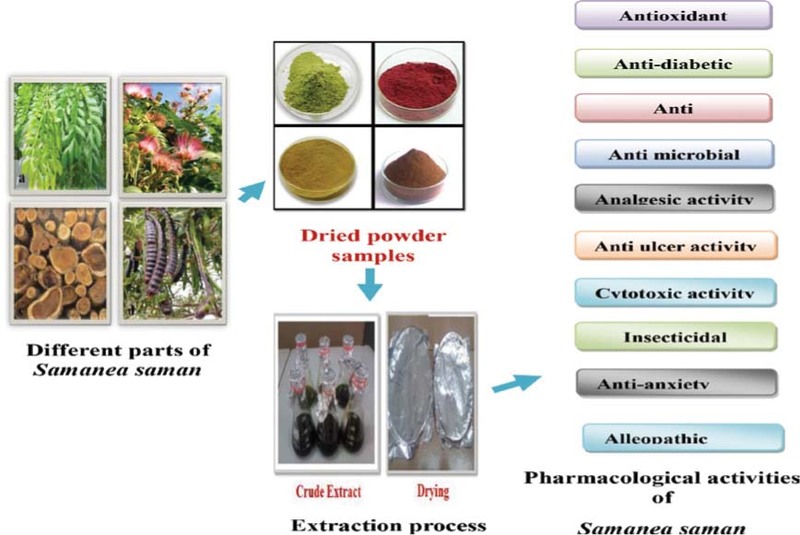 Pharmacological activities and traditional usage of the medicinal plant of Samanea saman has been reviewed in this study. Various extracts were evaluated for their antimicrobial activity against the different strains and antioxidant activity was determined. It expresses the characteristic compounds of various different parts of Samanea saman. 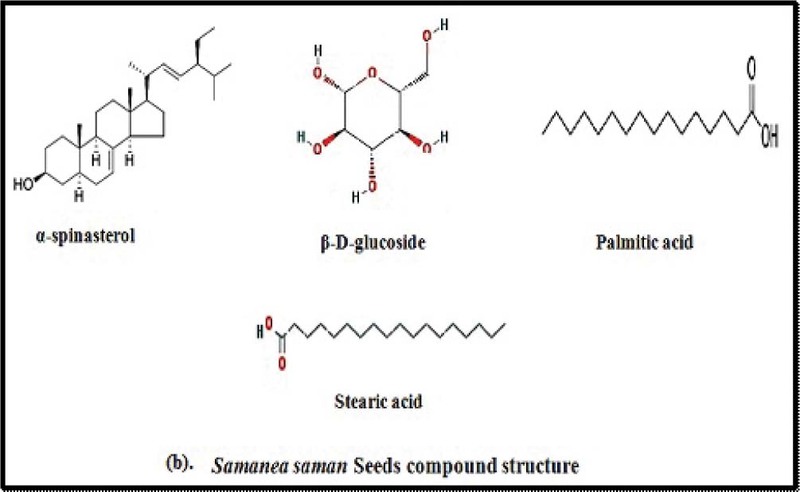 Knowledge of chemistry and biological effects behind this medicinal plant Samanea saman has been discussed in this review. The author thanks the VIT University for providing all the research facilities and support to carry out research process. Grieve MA , author. Modern herbal. Hafner press; New York: p. 915Dover reprint; 2vols. First reprinted 1971. Dover; 1931; New York, 902 pp.